Hello Amy and Julie, let's jump straight in, please tell me a little bit yourselves. We met at antenatal class when we were having our first babies. When they were born a group of us met up regularly and when our babies were teething, excessive dribbling and weeks of dropped or lost teethers made us think 'why doesn't someone invent a teether that is attached to the baby' so we did! We saw a gap in the market and developed a genuine world first bringing two of the most popular baby products together in one useful solution, our original chewy dribble bib the Neckerchew was born! What was the inspiration behind Cheeky Chompers – I love the name? 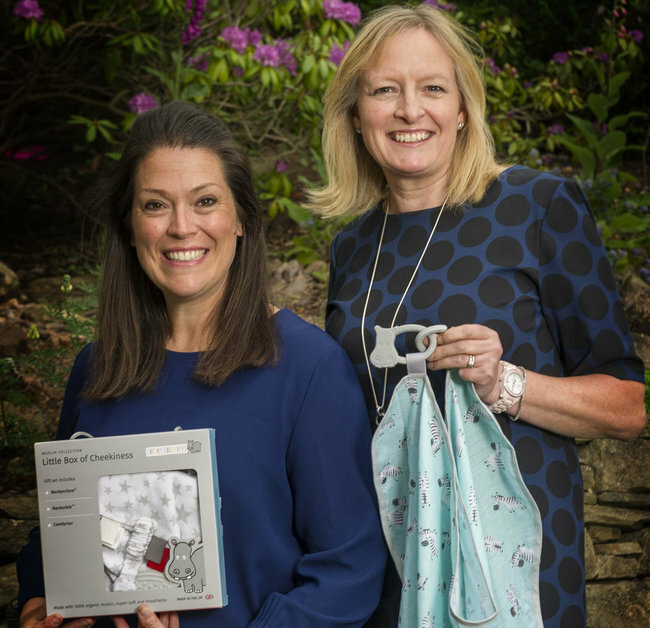 From the start, we really wanted to design and develop products to help make parents lives that bit easier, as new mums ourselves we really understood our market. We wanted three key things 1) to ensure our products were the best they could be in terms of the fabric, the teether material, the design, absorbency, washability etc. 2) We wanted our products to be made in the UK so we could be close by to develop and work with the factory to help ensure quality and create local jobs, and 3) we wanted to build a recognisable brand for parents that was always safe, stylish, innovative, empathetic and a bit cheeky and not look like two mums in the back room (when at the beginning that was often the case!). We share a real sense of cheekiness and this is a key part of our brand personality. We often referred to our little ones as our Cheeky Chompers and it just felt like the perfect fit for the company name when we developed the Neckerchew! What do you think sets you apart from other competitors? We are parents ourselves and are driven to create stylish and innovative products to make parents’ lives that little bit easier. We live and breathe by our strapline- great stuff that helps! We are constantly innovating, adding our intuitive ‘cheeky’ twists to everyday baby products to offer quality practical products for teething and new born babies. Being made in the UK also really sets us apart in a world where this is the exception rather than the norm. How do you fend off or deal with those moments of doubt, that every entrepreneur struggles with? Our business has grown incredibly year on year and we’ve had a very exciting journey along the way. However, having your own business is certainly not the easy option! It's so incredibly rewarding, but all consuming. We have had lots of moments of doubt along the way, but having each other for support and as a sounding boarded certainly helps, as has using our intuition, being part of our market and really understanding issues first hand. In addition, we’ve been fortunate to build a great network in addition to invaluable support from family and friends. What are your thoughts on networking to build a business? Networking is really important to us. We have met a range of business people who have been there before and it has been helpful. We speak regularly at conferences, have been lucky enough to win The Entrepreneurial Scotland emerging Entrepreneur of the Year and the EY Entrepreneurial Awards which have both been invaluable in introducing us to some great mentors. We also actively mentor a small number of start-ups in return and love hearing of fellow mumpreneurs starting their own business journeys. One of the biggest issues in business is finance. How did you both get Cheeky Chompers off the ground initially? We started the business with our own money and were lucky that our families and friends invested too. We have been lucky to fund our business through profit to date. Our appearance on Dragons Den was a huge success for us as although we didn’t secure funding, we had amazing endorsements from the Dragons, a boost of 30,000 people on our website the next day, fantastic exposure for the business and some great opportunities came out of it. One great outcome was an approach from Tom Joules who saw the programme and made contact, we’re proud of the resulting Cheeky Chompers collection with Joules. Great to know too that we smashed all the targets that we projected on the show proving the Dragons wrong! How did your business go from concept to launch? Like any business, with a lot of hard work! We started it while on maternity leave with our first children. Nine busy months was spent designing our bibs, sourcing quality fabrics and materials alongside stringent testing for safety. Better still, we found a specialist manufacturer here in the UK! Product went on sale in 2013. We have since expanded the range so it now includes the Comfortchew (2014), Chewy the teething Hippo and the Cheeky Blanket (2015) we also produce larger products for children and adults with oral sensory stimulation. This Summer we launched a new Muslin Collection which brings the magic of muslin and the stylish, innovative Cheeky Chompers touches to four great products. We’ve won numerous awards worldwide across the range and have a fantastic following of loyal parents around the world. We have had such an exciting journey which we would never have anticipated. We have just sold our millionth product! Not only are Cheeky Chompers products now available in many high-street stores such as John Lewis, Joules, JoJo Maman, Boots and many gorgeous independent baby and gift stores but also 70% of our business is in export sales where we have distributors in 35 countries with our biggest markets being the USA and Taiwan. We have a fantastic team of 10 people in our Edinburgh office now and 25 work on the Cheeky Chompers products in the factory! Tell me about your relationship as co-founders. Is it complicated to work with your friend in business, or does it work perfectly with the right mindset? Amy and I didn't know each other before we met that day in the antenatal class, so it is amazing to think how lucky we are to work so well together in business. Our partnership has really been a huge part of our success so far. It has not been complicated at all, we are both very passionate about our business and determined and driven to make it a success. We can look at things from different angles which works well as we scope out new product ideas and agree key decisions. We both act as devils’ advocates and sounding boards and it just works! Given we are generally juggling with young children, two sharing the responsibility of our business is also a benefit to try to keep a semblance of work life balance. We can have some weeks where we see more of each other than our husbands! Other than working for yourselves, what is the single most important decision you’ve made that contributed to your continued success? While signing up for our experience on Dragon’s Den was a great move I think we’d have to say our best decision was exporting early and quickly with a genuinely innovative product. We started exporting in the first three months of launch, selling internationally through our own website before appointing our first international distributors in Benelux, Germany, Hong Kong and Taiwan during the first six months of business. The number of distributors we work with grew fast, enabling us to sell our full range in 35 countries today. What is the one thing you find true, that most people would disagree with? Intuition is vital in business. We have made some of our best decisions with the help of our gut feeling! And missed some great ones by ignoring it. Has your initial business message changed since launch? If yes, how did it evolve? Core to our brand have been the values we share with other parents- our products are made by mums for our fellow parents. We make everything in the UK and test to worldwide standards just as we have since launch. What plans do you have for Cheeky Chompers over the next 12 months? We have an exciting year ahead to launch the new Muslin Collection across the world and a range of gorgeous new designs. We have developed a new 'essentials' Neckerchew line which is going into Tesco this Autumn to provide an additional every day option. Meet the co-founders of The Northern Dough Co.